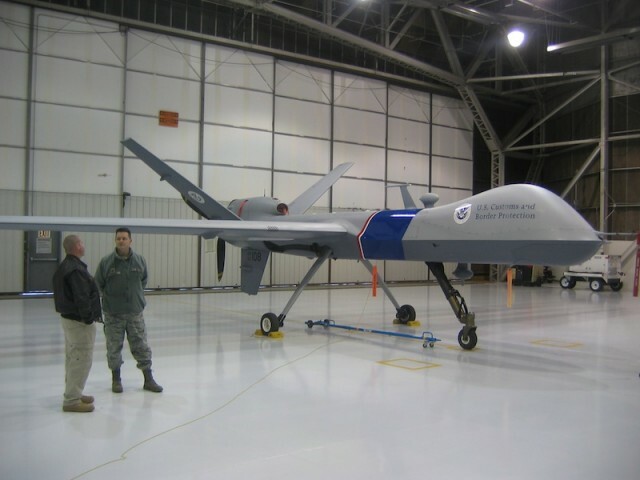 Unmanned spy planes are used by the United States to keep an eye on its border with Canada, as well as the border with Mexico. The aircraft are flown along the 49th parallel, looking for signs of illegal activity. At a base in North Dakota, Predators are piloted remotely. Step through the door of a large, windowless trailer on a U.S. air force base in North Dakota and suddenly you stand in the cockpit of a spy plane in flight. Two men sit behind the controls of the unmanned aircraft, which sends back images of the landscape along the border between the United States and Canada: endless, snowy plains in shades of grey. The pilots, assisted by a flight engineer, are controlling a so-called Predator, an unmanned aircraft that takes pictures of the largely unguarded border area between the two countries. The aircraft, equipped with radar and infrared cameras, can spot objects as small as about 10 centimeters from an altitude of 5,800 to 8,500 meters – human footprints, for example, crossing the border outside of the official ports of entry. 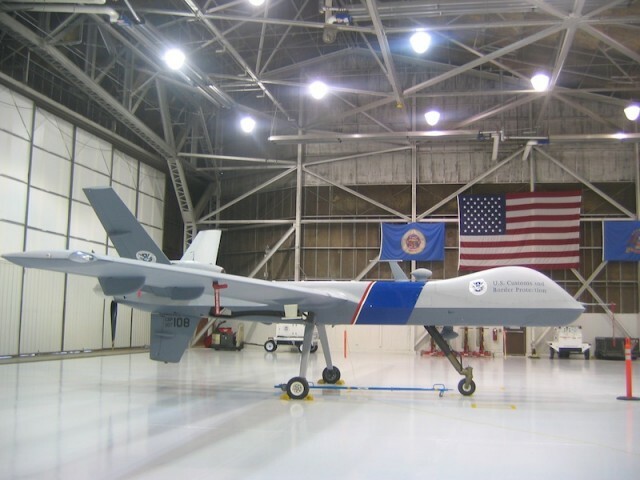 A ‘Predator’, an unmanned spy plane, in a hangar on a base in North Dakota. Predators are now used to watch the U.S.-Canada border from the Great Lakes to almost the West Coast, a band of about 950 nautical miles (about 1.800 kilometers) wide, along the 49th parallel. The planes fly back and forth, looking for indications of possible terrorists, illegal immigrants and drug traffickers from Canada – a country which, in the eyes of some Americans, has a lenient asylum and immigration policy and doesn’t crack down enough hard on marijuana grow-ups. Radars are also looking for low-flying planes of smugglers. Traditionally, the U.S.-Canada border is known as ‘the world’s longest undefended border’, but times have changed. Since the terrorist attacks of September 11, 2001, some Americans consider the open border with their neighbours to the north the weakest link in homeland security. Frequently, there are calls for closer monitoring, as on the border with Mexico. “While the emphasis is on the southern border, we realize that people could decide to come through the northern border,” says Priddy. Senator Joe Lieberman, chairman of the Senate Committee on Homeland Security and Governmental Affairs, called the report’s conclusion “absolutely alarming”. That position is indicative of the different perspectives on both sides of the U.S.-Canada border. Attitudes have diverged since 9/11, with the U.S. emphasizing security, and Canada advocating openness and access. The two countries, which signed a free trade agreement in 1988, maintain the world’s largest bilateral trade relationship: $1.6 billion in goods and services crosses the border every day. While this is significant to the U.S., to Canada it’s of vital importance. Predator in a hangar in North Dakota.